The Blue Ribbon Commission on Bayou Corne and Grand Bayou Public Safety continues its efforts toward reaching its goal of setting safety benchmarks for the Bayou Corne and Grand Bayou communities. While the BRC efforts are ongoing and more work is needed before the Commission finalizes its recommendations, the panel of experts have reached consensus on some fundamental benchmarks. -In order to lift the evacuation order, gas pressure in the MRAA and overlying aquitard has to be maintained at or below hydrostatic pressure. -Mitigation (such as barrier creation, sub-slab depressurization, ventilation) at each dwelling that is slab-on-grade or has enclosed crawl spaces needs to be defined as a second line of defense against gas accumulation. If conditions do not allow an effective mitigation system, indoor air monitoring is required. -Criteria for concluding that the threat from hydrogen sulfide gas is not a concern or is adequately controlled need to e established. Additionally, the Commission will review 3D Seismic results and are working to define and review modeling efforts that will assist in establishing and determining the timeframes necessary to meet safety benchmarks. The BRC is also developing the requirements and framework for long-term monitoring programs for both gas and stability issues as this will be critical in ensuring long-term safety of the community. In the short term, the BRC is also establishing specific requirements to collect data and information that is needed to set benchmarks and expedite the response effort. Previously, the commissioners completed a three-day work session in Louisiana and presented an overview of those activities at a May 1, 2013 public meeting in Napoleonville. The questions discussed, and the main conclusions reached during the work sessions, can be reviewed here. Since that time, the Gas Subgroup and the Stability Subgroup of the Blue Ribbon Commission have met by phone four times each, as well as a full commission meeting by phone as well. In addition, commissioners are hard at work reviewing information and communicating with other commissioners as well as other experts to work through the key questions that have been posed to the group. Commissioners have also been provided with access to numerous studies on the sinkhole and its impacts, including presentations from scientists working in conjunction with Texas Brine. By consistently matching these international experts with local and historical knowledge, the Blue Ribbon Commission aims to remain objective while dedicated to reaching valid conclusions that will ensure community safety. The BRC will provide a more comprehensive update at the July 16th Community Meeting and we look forward to seeing many of you at that meeting. For additional information on the Blue Ribbon Commission click here. The Commission is not tasked with day-to-day management of the response effort or questions of broader environmental or societal remediation, which will be handled through other processes. Rather the Commission’s role is to determine the conditions necessary to ensure that appropriate benchmarks are met regarding the mandatory evacuation order and the conditions in the area surrounding the sinkhole along the western edge of the Napoleonville Salt Dome in Assumption Parish, Louisiana. Additionally, the Commission will make recommendations regarding any long-term monitoring measures determined necessary to ensure the long-term safety of the public in the area. Early in the planning stages of a transportation facility, views from federal, state and local agencies, organizations, and individuals are solicited. The special expertise of these groups can assist the Louisiana Department of Transportation and Development (DOTD) with the early identification of potentially economic, social, or environmental effects associated with project development. Your assistance in this effort is appreciated. 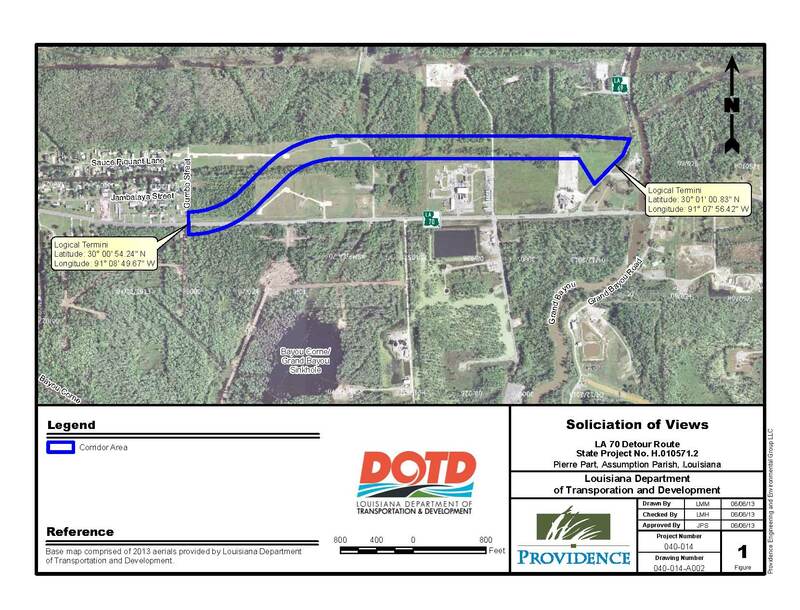 Providence Engineering is preparing two Environmental Assessments (EAs) to provide a detour route and bypass for LA-70 in the vicinity of LA-69. For a complete project description, click here. A map identifying the corridor area is shown above (and can be accessed in PDF form by clicking here). DOTD requests your views and comments within the next two weeks – deadline to submit is Wednesday, July 10, 2013. The next community briefing has been scheduled for Tuesday, July 16, 2013 at 6:00 p.m. at the Assumption Parish Community Center (4910 Highway 308, Napoleonville). Texas Brine has reported the floor of Oxy Cavern 3 has gone down to a level of 3,945′ which is 152′ deeper than last week’s measurement. It’s still unknown why this is occurring; however, we will update accordingly as information becomes available. Additional hydrocarbons are present in the sinkhole as a result of the burp that happened last night. Also noted, seismic activity has been active for the last few days. Click here to see a video of the sinkhole taken today. We’ve been advised that overnight, there was a burp in the sinkhole. No further information is available at this time; however, we will update once info becomes available.